Len Chandler and John Braheny presented the first Songwriters Showcase at the Ash Grove, L.A.’s oldest and best-known folk music club and the site of what was later to be the Improvisation. Len’s landlords, Bob and Rose Lane were fans of his from the Greenwich Village folk scene in the ’60s and wanted to see him perform live again. He had been writing three songs a day for the infamous Credibility Gap news satire show on KRLA and later with a TV version called Newsical Muse. John and Len had been performers, writers and recording artists. They first met in 1962, when John was opening act for Len at the Crooked Ear coffee house in Omaha, Nebraska. Bob Lane asked Len if he’d do a show if Bob would rent the Ash Grove for a night. Len agreed, but asked if he could also invite some writer/performer friends to share the bill. John offered to promote the event. The Showcase left the Ash Grove because of time conflicts with the club. It became apparent from the initial turnout that twice a month was not enough. From then on it was once a week. Lincoln Center West (later part of Natural Fudge), an intimate 40-seat theater on Fountain near Normandie. More and more industry response was generated. Some of the writers who showcased there during that period have gone on to bigger things: Janis Ian played “Stars” and “Jesse” there . . . Alan O’Day, who wrote “Angie Baby” (Helen Reddy), “Train Of Thought” (Cher) . . . Harriet Schock sang her “Hollywood Town” there before she signed with 20th Century as an artist. Johnny Stevenson showcased “Rock & Roll Heaven” (Righteous Bros.) there before a re-write with Alan O’Day became a hit. The reputation and vibes were drawing SRO crowds of writers and industry people. Ken Sasano, then of the Capitol A&R staff under Mauri Lathower, was a regular at the Showcase. He and Mauri agreed that the idea of bringing the popular Showcase into Capitol’s Recording Studio “B” would constitute an immense public relations boost for their ‘street’ image. They picked up the tab for the studio engineers, set-up crew, refreshments (popcorn & apple juice) to be provided free, with no admission charge. They also covered salaries for Len and John as well as their rapidly growing office costs. Capitol’s publishing arm, Beachwood Music’s then president Jay Lowy also picked up part of the showcase expenses during that time. All this was provided without ‘first refusal’ or any other strings attached. The Showcase remained totally independent in concept, internal growth and policy. Capitol reaped a well-earned ‘good guy’ image thru word of mouth and a lot of trade paper P.R. During that period there were two TV news specials devoted to the Showcase, seen on KNBC and KABC. On the KNBC special, Peter Noah was filmed auditioning a song called “San Antonio Stroll” which, in December 1975, was a #1 country hit for Tanya Tucker. The Showcase continued to draw crowds of 250 people until December 1973, when the Fire Marshall closed it down, due to the fact that maximum occupancy of Studio “B” was 36 people. On their first weekly Thursday night at Capitol, over 40 writers signed up for the “Two Song Hoot” that had worked for them as an audition method on a much smaller scale at Lincoln Center West. There was no practical way to accommodate this volume except to audition those writers at another time. Capitol’s Studio B was magic. Studio monitors were set up surrounding the audience who were sitting on chairs and on pillows on the floor with Capitol’s engineers mixing and (until the AF of M stopped them) providing the showcasers with the only existing tape copy of their performance, free of charge. Capitol gave $50 per week in salary for what, at that time involved a minimum of time to book the Showcase. Shortly thereafter, industry pros began to express their desire for the songs to be more tightly screened for commercial potential. They felt that unless that screening took place, it wouldn’t be worth their while to attend. Obviously, if industry people weren’t there, it would be of little value to the writer who showcased. At that point Len’s studio behind his house, at 943 N. Palm Ave. in West Hollywood (now an apartment complex), became the first Showcase office. Phrannie Goldfarb volunteered as the first secretary, to help book audition appointments in half-hour sessions, eight-to-ten a day, in addition to logging in tapes to be screened. A beauracracy developed to keep track of all the writers, songs, tapes and whether they wanted to showcase them or not. They worked out a rating system on the songs on a 1-to-5 scale for words, music and commercial potential and indicators of musical style, tempo, intensity and gender to help them put together shows that were varied and interesting. By this time, the Showcase was taking a major portion of Len and John’s time. 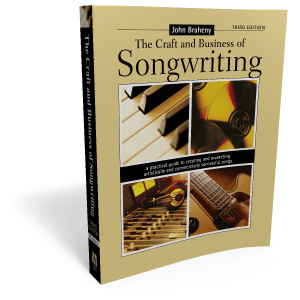 John was pursuing a career as a writer/producer of music for radio and TV commercials with spots for Toyota, Borax, Southern California Gas Company, Pioneer Electronics and many others already under his belt. He had less and less time to pursue those jobs. It became apparent that there was a rapidly increasing need for corporate sponsorship. While the Showcase was at Capitol, Ron Anton, then West Coast v.p., and Rick Riccobono, then a membership representative of BMI (now West Coast v.p. ), were attending the Showcase weekly, talking to writers about BMI and bringing publishers and producers to see current or prospective BMI writers. They were very excited about the Showcase idea, which presented a focus for new writers in the spread-out L.A. community. What they were seeing, however, was two young artist/writers with the musical background, the creative organizational sense and honestly and dedication who were doing it beyond what they imagined they could do themselves. They wanted to be involved as financial sponsors. The late Helen King was then the West Coast coordinator of AGAC (now the Songwriters Guild of America) and a year away from founding SRS ( later renamed the National Academy of Songwriters (NAS)). Helen assisted in putting together the proposal. BMI came up with a workable agreement and funding within two weeks. BMI’s ‘no strings attached’ supportive attitude and philosophy and genuine dedication to helping songwriters on a grass roots level meshed perfectly with Len and John’s approach and, in July 1973, a collaboration with BMI began that would last for 18 years. BMI’s support allowed the Showcase to expand their staff and continue their services to all songwriters regardless of their performing rights affiliation. Continue to Part 2 1974 t0 1981 The Showcase responds to community needs – The songwriters Expo and more.